Every kid wants one, but lightsabers have to be one of the most dangerous items in the Star Wars universe. A kid at the controls of the Death Star would cause less damage than one swinging around a laser sword. 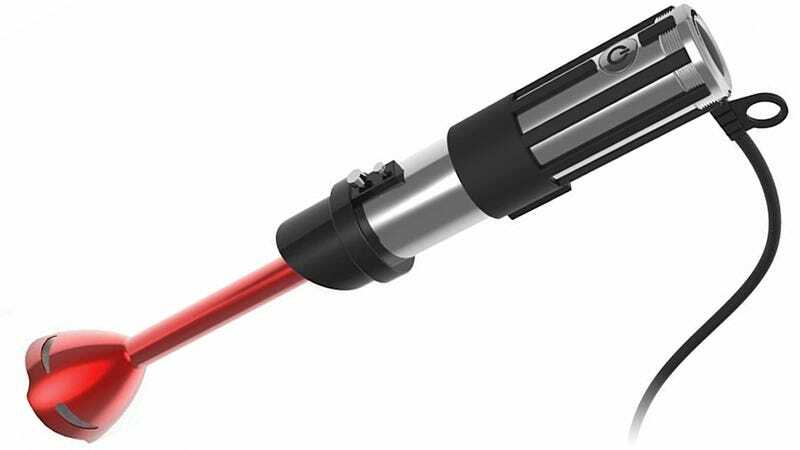 This immersion blender, featuring Vader’s lightsaber’s hilt for its handle, isn’t much safer, but at least you can’t cut your hand off with it. Fingers are another story, though, so this is the last piece of Star Wars merchandise you’re going to want a kid to be playing around with. It’s designed for use by legitimate chefs who don’t mind a bit of whimsy in their kitchen. Featuring a speed dial on the top of the handle, a blending arm painted red to simulate a lightsaber’s blade, and the ability to blend up an out-of-this-galaxy guacamole, it’s exactly what you need in your own Star Wars cantina. At $50 it’s not the cheapest immersion blender you’ll find, but with a 300-watt motor it will also make short work of ice, and even carbonite.